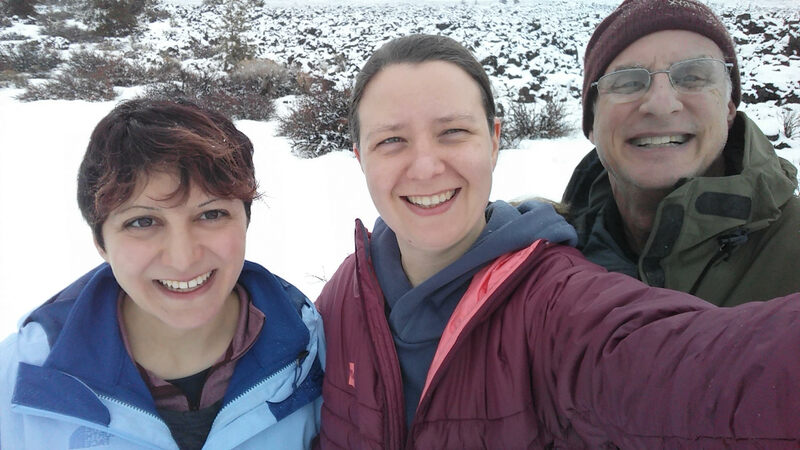 On our second day, it was snowing, so we decided to stay on the paved path and made our way to Arco Tunnel which was no longer open to the public. This cave was a good place to weed out anyone who is claustrophobic, since at the very entrance, we had to belly crawl through two very, very narrow openings (happy to report that I made it through with minimum internal swearing). For more samples, we went deeper into the cave. We collected a total of five samples from Arco with one of them being from a moist green layer which covered the walls of a small alcove. We decided to not go any further as we had already spent about four hours in the cave, and our guide was getting a little restless. We crawled out of the cave and were greeted with many inches of snow on the ground and more falling from the sky. Even though the initial plan was to collect samples from Indian cave as well, Elena decided to take her team to safety instead. Our trip ended with pizza, an old wild-west movie, and a semi-philosophical discussion at a friendly local pizza restaurant. Bards will be singing about our daring odyssey for millennia to come. This entry was posted in Idaho 2018 on January 9, 2018 by Nicole Wagner. 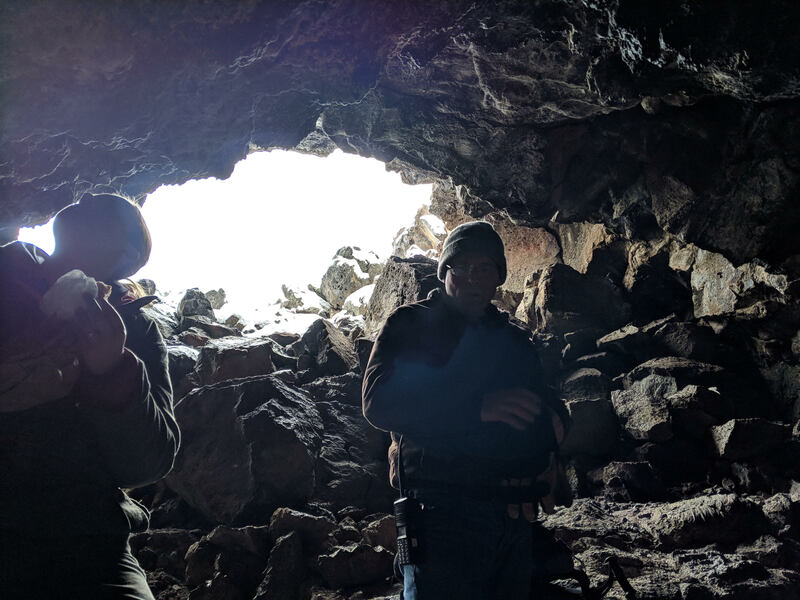 On our first day, since the forecast was all sunshine and smiles, we decided to go to the caves that were off the paved path; so we began our trek over meters and meters of ice-covered lava. First cave we went to was Last Chance. We climbed down a steep rocky surface to look for signs of life in the dark tunnel. 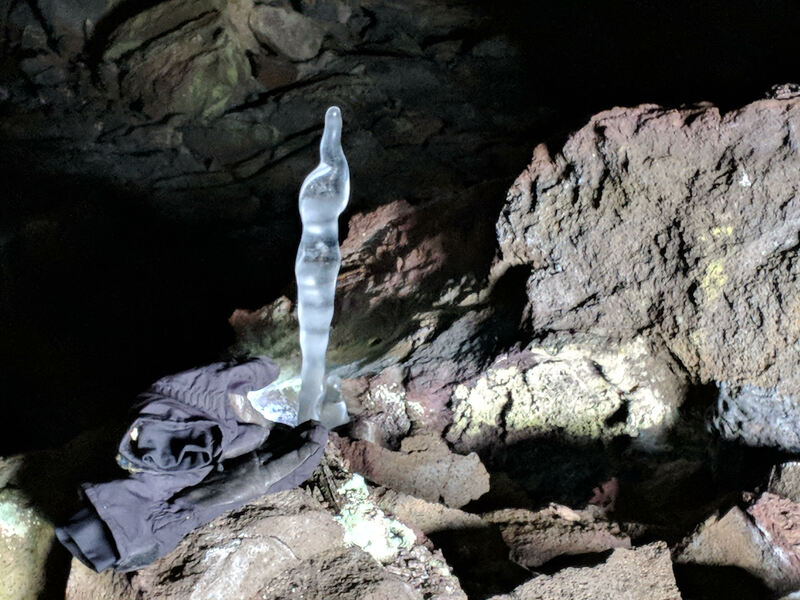 At the entrance to the cave, there were some pretty amazing ice stalagmites, which at first, we thought were bottles left behind by other visitors. Our “Pfft, some people, right?” Turned quickly into “Oh, just Fa-Bu-Lous!”. We had to go deep into the cave, far from light, to find biological matter appropriate for sampling. At the end of one of the tunnels, we found two small layers of thin biological matter which Elena took samples from. The plan is to extract DNA and RNA from these samples to see if any metabolically active life is present in the cave in winter time. Next stop was Needles, a cave that Elena had been to previously and was curious to see how much it had changed since her previous visit, and the third stop we made was at Hidden cave. 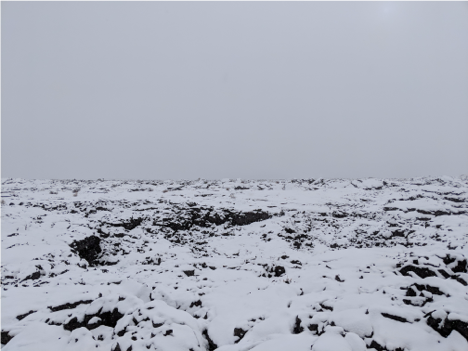 Deep inside the latter, far from any light, we found two very interesting mounds of biological deposit, which from a distance looked like piles of snow. We collected a good amount of sample from these deposits which we will be extracting RNA and DNA from. Before we left, the Magnificent Steve Squyres, who was curious about the formation of the mounds, decided to experiment on them. 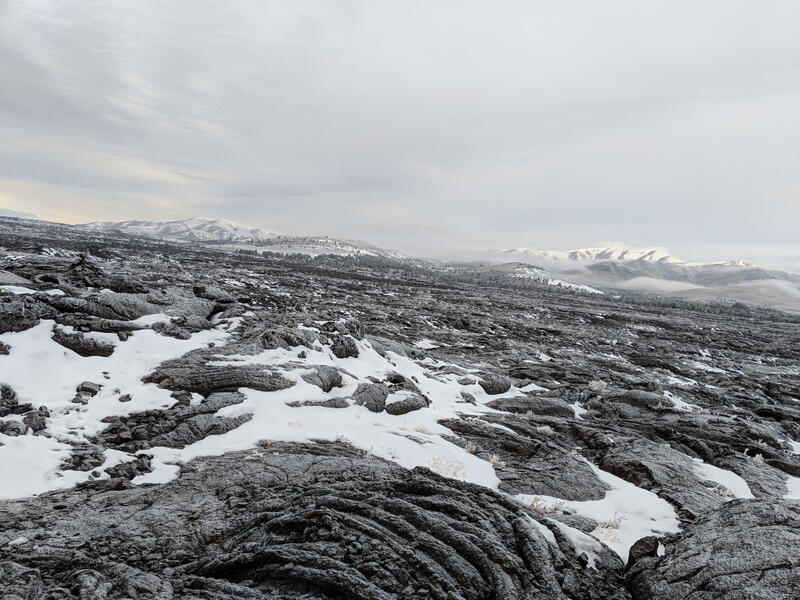 The first hypothesis was that they’d formed from the water that had trickled down onto the ground, but Steve noticed the completely vertical holes present in the mound, so hypothesized further that water from above actually dissolved it, and that there must be some sort of “plumbing” underneath the mounds that led to its growth. To test that water from above was detrimental to the biological samples, he poured some water out of his bottle onto the mounds, and we witnessed the porous matter dissolve very quickly right in front of us. Unfortunately, we had to leave before Steve could come up with other experiments (Elena suggested getting permission to remove the entire mound to see what was underneath, another time). By the time we left the cave the sun was shining and all the ice had melted, so we had quite a pleasant walk back to the car. We ended our day with a delightful Mexican dinner and Steve’s tales of daring Martian exploration! This entry was posted in Idaho 2018 on January 8, 2018 by Nicole Wagner.